Suspended high among the pastel clouds of Bespin, held aloft by huge repulsorlifts built into its curved frame, is a floating metropolis of sophisticated beauty and political freedom. The city is disk-shaped, with the upper concourse covered in circular landing platforms and towering spires. Beneath the city's belly is an immense spire that ends in a bulbous unipod. The interior corridors and plazas of the city are spotless white and chrome, providing an airy feel even when indoors. These pristine malls conceal the industrial heart of Cloud City. The gas processing facilities, smelting rooms and carbon-freezing chambers of the airborne city aren't as aesthetically pleasing, but they are modern and efficient. Imagine a material [namely, ultra-dense deuterium] so heavy that a cube with sides of length 10 cm weights 130 tonnes, a material whose density is significantly greater than the material in the core of the Sun. So, what can you do with ultra-dense deuterium, laboriously mined from the depths of mighty Jupiter? 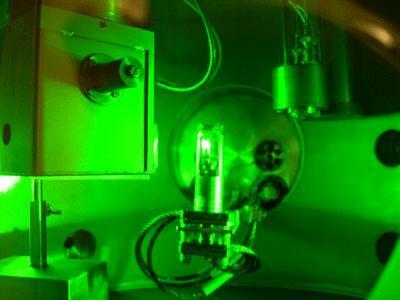 How about laser-driven nuclear fusion? “One important justification for our research is that ultra-dense deuterium may be a very efficient fuel in laser driven nuclear fusion. It is possible to achieve nuclear fusion between deuterium nuclei using high-power lasers, releasing vast amounts of energy”, says Leif Holmlid, Professor in the Department of Chemistry, University of Gothenburg. Want green power? Embrace cloud cities. 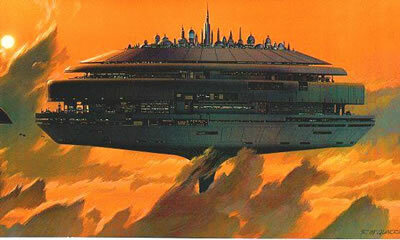 See also this example of another (fictional) cloud city right in our own solar system (thanks, Perry), as well as information about Tibanna gas mined on Bespin, which bears some interesting coincidental similarities with ultra-dense deuterium (thanks, Yossi). Sources: Ultra-dense Deuterium May Be Nuclear Fuel Of The Future via io9; thanks to Armisius for the tip.